The trouble with enjoying my weaving is that I start to get ideas. I wonder, "what if I did this," or "what if I changed that." So too with the spaced dyed yarn weaving. As I worked on the 1st space dyed yarn blanket, the wheels were already turning with ideas for another. Click pic for a slightly larger view. 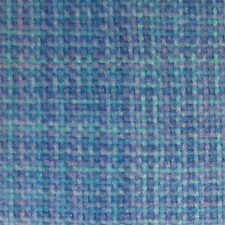 This one definitely has a more plaid-like look than the first one. I did nothing special to line up the color sequences of the space dyed yarn. I measured and wove as it came off the skein. 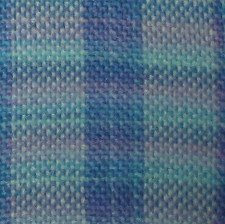 Wet finishing: soak in warm water for about an hour, then machine wash and dry with a dryer sheet to soften the hand. 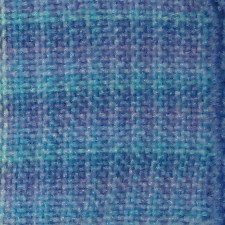 Color transition - the change of colors in the first blanket's yarns are more obvious. In this blanket, the color changes are subtle. These last two exercises in weaving with space dyed yarns have inspired me to want to try doing my own warp painting and space dyeing. In fact next month, Karen Madigan is going to give an Online Guild workshop I plan to participate in, "Easy Warp Painting and Ikat." However, what I'm supposed to be doing at the moment, is getting ready for the Complex Weavers Tied Weaves Study Group which commenced this month. And I am, I promise. In fact I've begun a review of summer & winter weave. I'll see how well I can write that out next time. OK that DOES IT! I am going to completely copy you and use the space dyed Acrylics for the baby blankies I have to get done. Thank you for so "boldly going" (can you tell I was a Star Trek fan?) before me. I love the look, the ease of how they weave up, the washability, and the crocheted edgings make them a snap and so pretty. 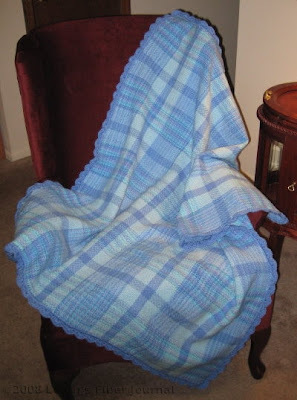 About how many skeins of yarn did you use for this blanket? I love it!!! 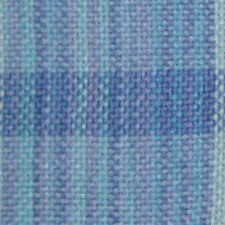 I love weaving with space dyed yarns! It's easy to see how any color lover would be inspired. I really don't know how many skeins this actually took as I used leftovers from another project. I can tell you that it took about 1230 total yards of yarn. I can also tell you that I ran out of some and had to get more, sort of the cereal-an-milk-effect, because I still have leftover yarn! Very subtle coloring. And a very balanced weave, too. Great! some small person will love it, and it's super practical as well. The crochet edging is lovely too. So beautiful and so practical. You've been quite productive - you must be stocking up on Christmas presents. That turned out so beautiful. I've been experimenting with my own hand painted warps. Some have worked, and the last one, not so much. I like how you've used a variety of leftovers to achieve a dramatic effect. It's gorgeous. And you did that over one weekend???? Wow. Looks as though I am going to have to practice my crochet! That gives a really wonderful finish to a lovely blanket. Very nicely finished. And thanks for the info about Kaz's workshop, too. 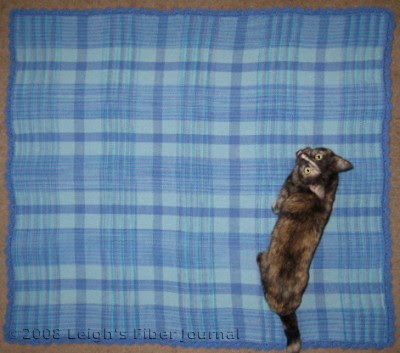 Nice blankets, Leigh! My latest is still on the loom, but there aren't enough hours in a day for me at the moment! Okay, I am so seriously impressed here!